We all have those staple beauty items that no matter what new innovative products come out or how ever good the deals are elsewhere we will not sway from. Nothing else will simply do. 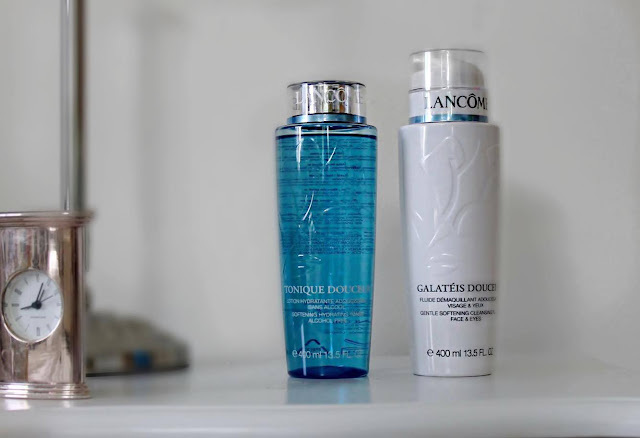 For the last four years I'd say mine have been the Lancome Tonique Douceur and Lancome Galatéis Douceur Cleanser. After a rather good pay day I decided to head to the Lancome counter in House of Fraser Guildford, wanting to buy a foundation. I bought the Lancome 24 ultra (which is fantastic and deserves it's own post) but also headed out with an extra purchase. The assistant had prepped my face using the Lancome toner and the smell of it drew me in. My skin felt instantly refreshed and she showed me on the cotton wool how much hidden dirt and grime (not to sound like a Mr.Muscle advert) was concealed on my face. The toner became my fixation, the difference in my skin was noticeable after a week, I generally have quite clear skin but it can be quite uneven and this really helped to smooth it all over. It was also lovely in the mornings for hydrating my skin and giving me a soothing wake up call. Because this product is alcohol free it's not as harsh as other toners on the market and so doesn't take out any naturally good properties your skin has. However, it is very important to remember to always moisturize after. This then made me want to try more products in the skin care department. I then moved on to the cleanser as my make up remover. Gentle on the skin with noticeable results, its a winning product. 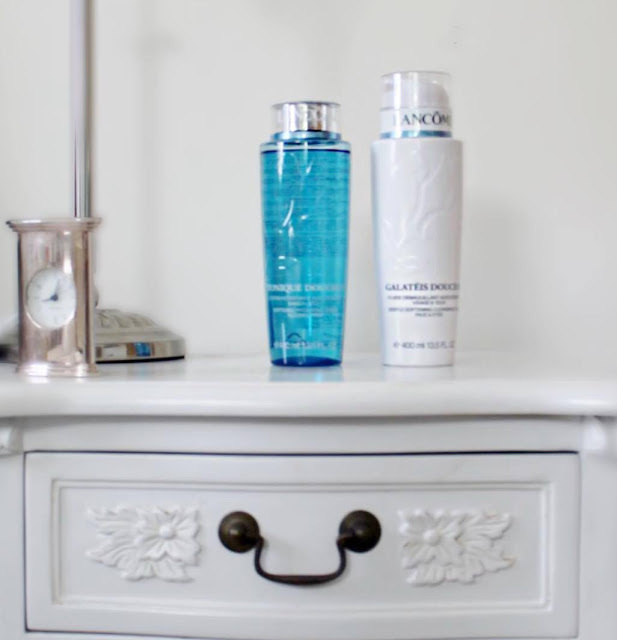 Some cleansers can tend to strip your skin but Lancome's light formula is friendly and effective. It does however, struggle to get off mascara- in particular waterproof. I always recommend using an oil based remover for eye make up, I'm really loving Salma Hayek's make up remover in her new Nuance range, it is very oily though so I'd just use it for the eye area! But for the face stick with the cleaners for fast results. If you want to buy these products get both at once! They are slightly pricier but I think investing in skin care is so much more important then spending money on make up. Plus you can get two huge bottles for such good value especially this time of year in stores. Maybe even ask Santa to see if he'll bring you some.